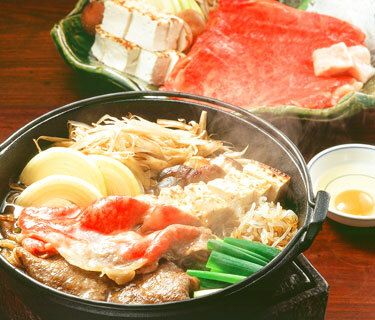 One of the best known Japanese dishes in the world is "sukiyaki." It originated from "gyu-nabe (beef hot pot)," which became extremely popular in the Meiji Era immediately after the period of national isolation, when Western-style cuisine was imported from abroad. You can enjoy your fill of the fine texture and taste of Joshu Wagyu with this recipe. 1) Prepare warishita by mixing sake, soy sauce and sugar. 2) Whittle burdock (see "Yanagawa-nabe") . Cut onion horizontally in approximately 1/3 in. (7mm) thick slices. Cut leek into segments approximately 2 in. (5cm) in length. Cut off the lower stem of the shiitake mushrooms and slice them diagonally. 3) Cut broiled tofu in bite-size. Coarsely cut and blanche shirataki. 4) Place beef and other ingredients in a sukiyaki pan and add the warishita to simmer. Dip the cooked ingredients in beaten egg before eating. Joshu Wagyu is raised carefully over a long period, while effectively using the water resources of Gunma, which contain abundant minerals. Japanese Black cattle of good pedigree are fed of originally selected feed for the purpose of raising high-quality beef cattle. Its characteristics include a fine texture and rich taste. Broiled tofu is a tofu broiled over direct heat to brown the surface. Because it does not dissolve easily and the flavor of soup permeates it well, it is used for sukiyaki, oden and other stewed dishes. Shirataki is a soft, white, noodle-like food made of konjac. The flavor of warishita permeates it well, and as such it is one of the staple ingredients for sukiyaki.